For a 13-year-old monster-crazed kid in 1971, attending the latest Vincent Price movie at the local theater on Saturday afternoon was a major event. Price was THE horror star of the time, having assumed the mantle when King Karloff passed away a few years before. Not to take anything away from Mr. Cushing and Mr. Lee, but “Vincent Price Movies” had become, like “John Wayne Movies “, a sort of genre unto themselves. AIP had squeezed about every nickel they could out of the Edgar Allan Poe name so, with the release of THE ABOMINABLE DR. PHIBES, a new character was created for the horror star, the avenging evil genius Dr. Anton Phibes. Phibes is a concert organist, theologian, scientist, and master of acoustics who uses his knowledge and vast wealth to gain revenge on the nine surgeons who (to his mind) botched an operation that killed his wife. 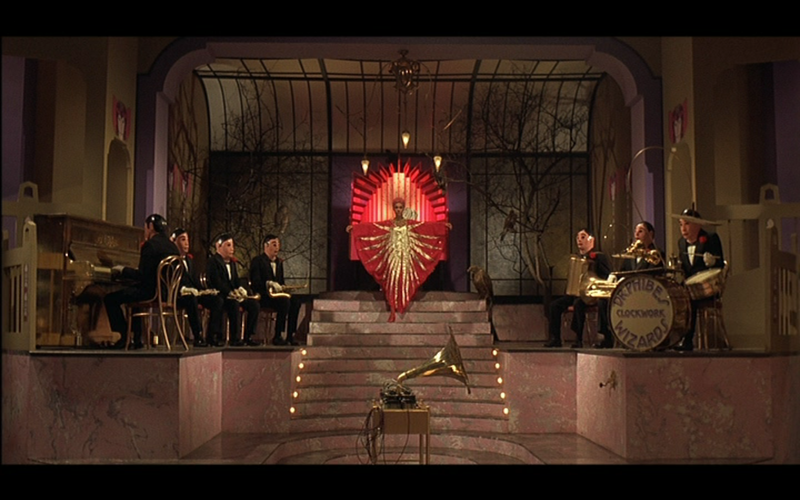 We first see Phibes in his art-deco lair, playing the organ ala THE PHANTOM OF THE OPERA. Winding up his animatronic band (Dr. Phibes’ Clockwork Wizards), his silent, deadly, and beautiful assistant Vulnavia enters, and the two dance to “Darktown Strutters Ball” (and yes, that familiar singing voice is good ol’ Paul Frees !). Phibes and Vulnavia then proceed to visit one of the doctors, dropping a battery of killer bats into the sleeping surgeon’s bedroom. This is just the first of many gruesome deaths Phibes has planned for the surgical team. With the Old Testament Ten Curses of Egypt as his template, the fiendish Phibes exacts his revenge using frogs (a frog’s head mask at a masquerade ball squeezes its victim’s neck, decapitating him), blood (draining every last pint out of Terry-Thomas ), hail (a locked car is equipped with an ice making machine), rats (a biplane pilot trapped with the furry little devils), livestock (impaled by a catapulted unicorn’s head), and locusts (boiled Brussels sprouts poured on another sleeping victim, descended upon by locusts who eat her flesh). Inspector Trout of Scotland Yard has been assigned to investigate the bizarre goings-on, feeling the heat from his superior Crow, who keeps calling him “Pike”. Trout learns the dead doctors all worked with the eminent Dr. Vesalius, and on one case in particular. But Victoria Regina Phibes husband was killed in a car accident, so it couldn’t be him… could it? Vesalius is given reason to belive that somehow, Phibes escaped the fiery crash, and is alive and unwell somewhere in London. 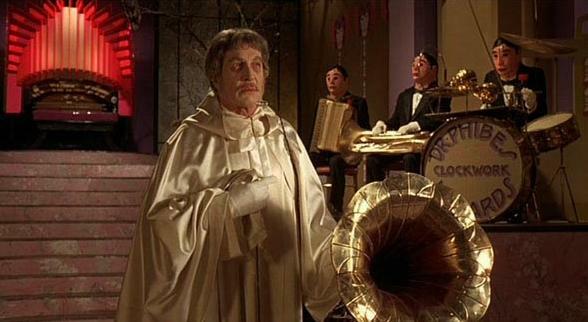 The two men exhume the Phibes’s coffins, discovering ashes in Anton’s coffin. 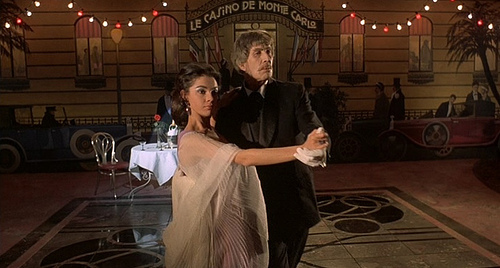 Trout suspects they belong to Phibes’ chauffeur, and when they open Victoria’s coffin, her body isn’t there. 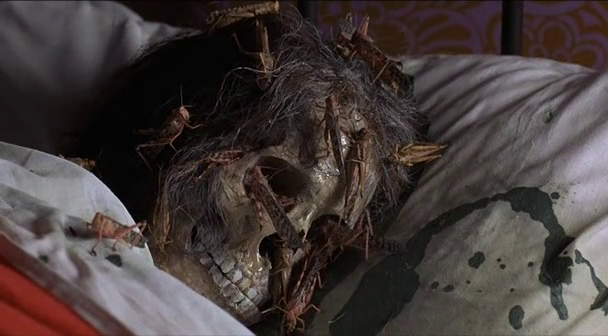 Phibes kidnaps Visalius’s son, vowing to place the death of the firstborn curse on him. He implants a key into the boy’s ribcage, and Visalius must race against time to remove it and free his child before the slowly dripping acid hits his face and kills him. Trout and his men show up, looking for Phibes. Vulnavia sacrifices herself so the mad Phibes can carry out the final curse for Victoria and himself… the curse of darkness. Price has a field day as the deranged doctor. With tongue placed firmly in cheek, the role requires him to act mainly with his eyes and body. His voice is only heard through an electronic box he’s invented with his acoustical genius. 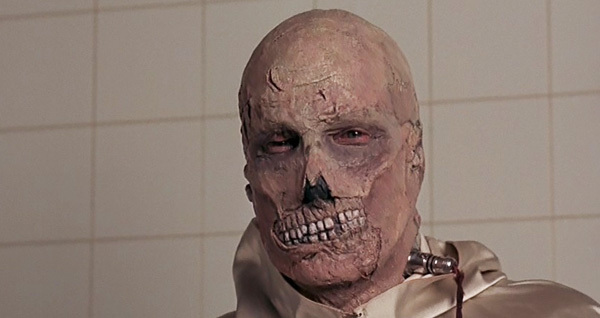 Phibes speaks haltingly, lips not moving, due to the horrific damage done to him in the accident (which he reveals to Visalius during the climax). Trevor Crole-Rees’ makeup job on Price is sufficiently eerie (remember when makeup artists were horror film rock stars?). 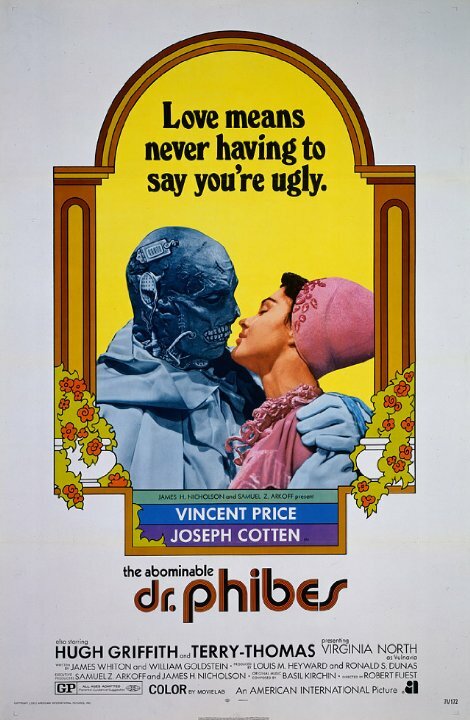 By the way, Phibes’ wife’s name is an in-joke for Price fans, as he first came to fame acting in a Broadway play titled “Victoria Regina” opposite Helen Hayes. Joseph Cotten costars as Dr. Visalius, a long way from CITIZEN KANE and Jedediah Leland. My favorite actor here is Peter Jeffrey as the put-upon but dogged Trout. Jeffrey was offered but turned down the role of Doctor Who in the mid-sixties. Oscar winner Hugh Griffith (BEN-HUR) plays a helpful rabbi. Model Virginia North, who appeared in ON HER MAJESTY’S SECRET SERVICE, is the bewitching vixen Vulnavia. Another Bond Girl, Caroline Munro (THE SPY WHO LOVE ME), plays Victoria… sort of. We see her only in photographs and, at the end, as a corpse. Munro was also a veteran of Hammer horrors (CAPTAIN KRONUS- VAMPIRE HUNTER, DRACULA A.D. 1972), Ray Harryhausen’s THE GOLDEN VOYAGE OF SINBAD, and starred as Stella Star in the cult classic STARCRASH. 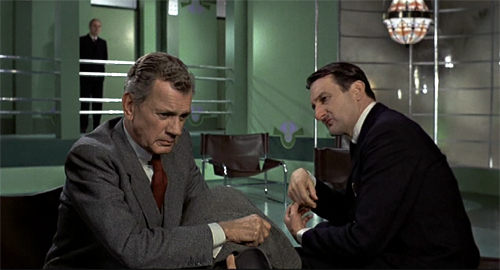 Vincent Price starred in the sequel, and had other successes with the revenge horrors THEATER OF BLOOD and MADHOUSE. But by the mid-70’s, tastes in terror were changing, and soon slasher shockers would rule the horror roost. The classic monsters (and the actor’s who portrayed them) gave way to Michael Myers, Freddie Krueger, and Jason Voorhees. And though change is inevitable, there are still fans of the masters like Karloff, Lugosi, Chaney, Lee, Cushing, and Vincent Price today. As long as there are classic movie buffs, both those who grew up with these films and younger fans discovering them via TCM and other media outlets, the works of these genre greats will live on. Helping to keep them alive is what makes blogging here on Cracked Rear Viewer and Through the Shattered Lens so rewarding for me. A classic beloved by my family growing up. So that’s why I’m like this. AIP warped many a fine mind, including yours truly! I watched it last night Gary. It was perfect fodder after the stagger back from the pub. So enjoyable. Only Vincent Price could pull off never speaking apart from a electronic neck mouth. So fun to see Terry Thomas stereotyped as always as the saucy old man, would of loved to have seen more of him. The evil brussels sprouts hehe and all the ingenious death scenes. And oh my god, she made me weak at the knees, Virginia North as Vulnavia. A great end to the evening. Cheers for putting me on to it.